What if the American public decides at the ballot box that what passes for the prevailing public interest (really a manufactured imposition) runs counter to its own version of said interest? Who orchestrates the “pitiless publicity” aimed at killing competing visions of the “public interest” and by what authority do they undertake this mission? Conceivably a tug of war could ensue between two competing visions of the public interest; one vision expressed at the ballot box in the manner of direct democracy and the other emanating top-down from managed democracy’s “invisible rulers”. 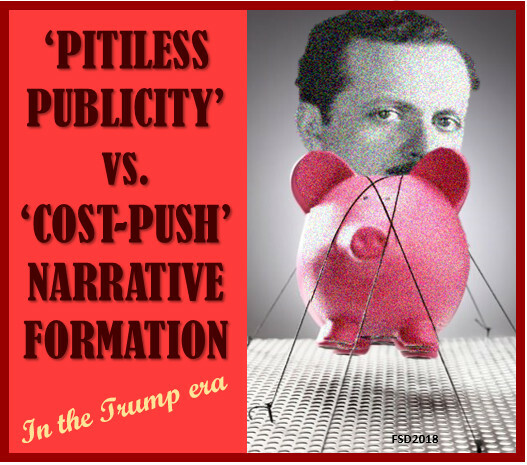 For Bernays such a conflict would not represent an intractable impasse so much as a cue for redoubling the, “conscious and intelligent manipulation of the organized habits and opinions of the masses”. After all, only intensified propagandizing efforts can correct the People’s ill-informed sense of the public interest. Undemocratic manipulation is, “an important element in democratic society” under Bernays’ weirdly circular formulation. Of course self-determination is neither a path to infallibility nor a vaccine against public policy blunders. Direct Democracy merely makes the People the masters of their own fate, which is equally to say the captains of their own errors. Bernays would have been better to say manipulation is a vital facet of a smoothly running Republic or Oligarchy, not so much a Democracy. His paternalistic subtext clearly reflects the former. Indeed another name for Managed Democracy is Republicanism (not to be confused with the political party of the same name). A rough but effective analogy can be drawn from what serve normally as macroeconomic terms used to describe two varieties of inflation: Cost-Push and Demand-Pull. For an explanation of the traditional economic context of the terms, see here. Applied to political narrative formation, Push is the bottom-up, propulsive force of the Will of the People. While Pull is the manipulative, diversionary desires of the Elite. Push is hard knocks and demonstrable scrapes. Pull is consciously engineered wishfulness harnessed to oligarchic solipsism, Empire objectives and atrophying noblesse oblige. Popular consent should be organically derived and not subject to extrinsic manufacturing at all. Nor should its germination process be invaded by an externally fashioned agenda. The People should be the authors of their own consciousness. That’s the ideal anyway. The Culture Industry’s mandate is steeped, from the outset, in inauthenticity and misdirection; or, as Theodor Adorno insisted, structurally inescapable insincerity. Through the endless propagation of false consciousness, Media is charged with convincing the People that the Pull is actually the Push. Sustaining this inversion has become a difficult task. The last chart addresses Russophobia. 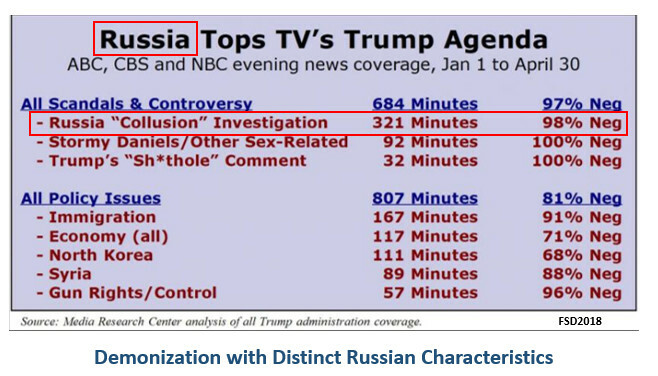 Anyone who’s walked past an American TV over the last two years can attest to a media obsession bordering on the manic; an intensity not shared by (nor successfully seeded within) the American public as evidenced by a July 2018 Gallup poll showing concern about Russia to be immeasurably unimportant (the issue garnered an * meaning less than 1%). 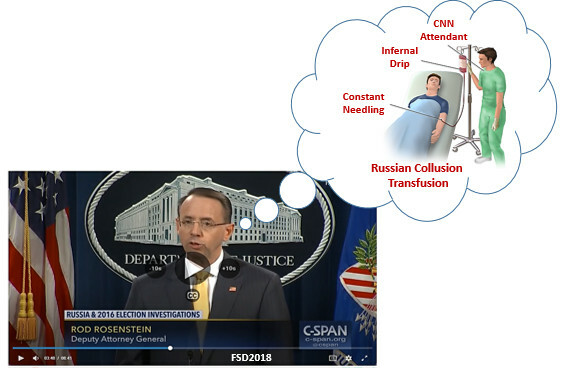 Deputy Attorney General Rod Rosenstein fed the sui generis racialist fires when he referred with casual malice to The Russians (wink-wink-nudge-nudge) in his February 16th indictment press conference for Concord Management officials who happened to be Russian nationals with no discernible state actor affiliation. The farcical social media trolling charges relate to “spread[ing] distrust towards the candidates and the political system in general”, as if the American populace wasn’t already immersed in boatloads of domestically-inspired skepticism. Chances are slim the politically-motivated indictments (announced on a Friday in part to the get the Parkland, Florida shootings off the front page) will ever come to trial despite Concord’s heroic efforts to have their day in court (see 3:48 here). Today’s Russophobic dog whistles recall John Maynard Keynes’ 1932 assertion that Bolshevism sprang from, “some beastliness in the Russian nature”. 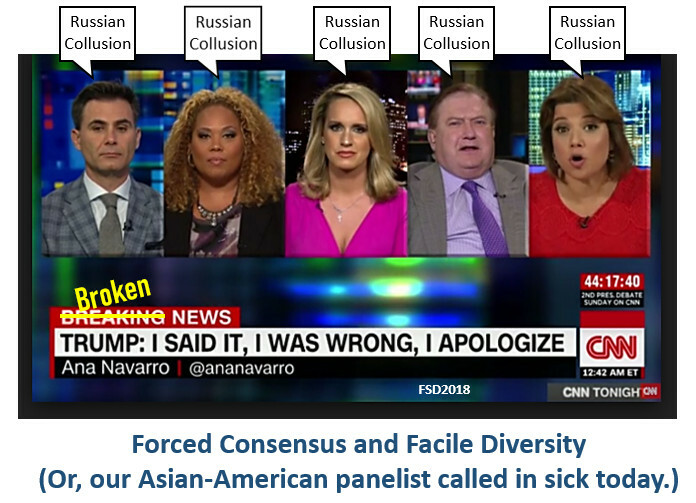 Far from dispelling these beastly stereotypes, CNN reinforces them nightly for the ‘higher dual purpose’ of de-legitimizing the Trump Presidency and positioning Russia as the Military Industrial Complex’ Enemy of Requisite Budgetary Scale. Attorney Alan Dershowitz has routinely decried the ACLU’s MIA status throughout the Trump Russia witch-hunt. The same can be said of the Anti-Defamation League (ADL) whose charter states: “We fight anti-Semitism and all forms of hate.” We’re familiar with battles waged on behalf of the former, less so the latter. Here’s an opportune chance to engage on behalf of another besieged group. Russian-Americans comprise 3.13 million people, a sizable population by any metric. Surely Russophobia (a dark retread of Nazism’s Anti-Slavism) warrants urgent attention. Blessed be the stoic forbearance of our Russian neighbors. One hopes it is a circumspection that will continue to go unpunished, though the Japanese and German internment camps that dotted WW2 America hardly inspire confidence. As we see in Syria and elsewhere this authorial prerogative is increasingly being shared by Russia in either a nascent reemergence of bipolarity or an interim way-station towards a multi-polar actor ensemble. 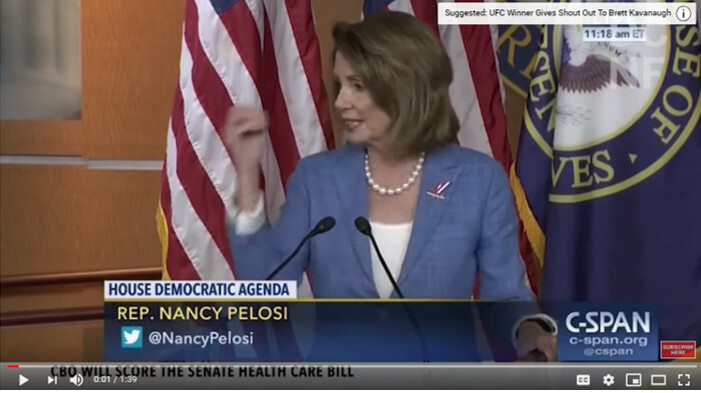 Another Pull variant is, as Nancy Pelosi so helpfully anatomized for us, the wrap-up smear. This is the technique of creating a false set of facts (the smear), “merchandising” the false fact pattern to the Media, then wrapping the smeared individual in the ensuing tar-and-feathery media glare until the former stops beating his or her spouse lately. Of course the ensnared victim is obliged to continually reference the false facts if only to mount a self-defense. Perversely, righteous denial further reinforces the falsehoods through repetition. There is, as they say, no such thing as bad publicity if the purpose is to keep one’s name front-and-center, which in the case of a wrap-up smear, it most surely isn’t. Again, the purpose is to pull the media consumer towards a desired narrative based on falsity and distortion. The news-maker advantages his or her podium to initiate news that only becomes news by virtue of a bully pulpit (one of the top-down trappings of power), and not by the inherent truth-value of ‘facts-on-the-ground’. Putin and Trump, the world’s most potent nationalists, are no strangers to being wrapped in deceptive, pejorative garb. A crucial point to note is that both leaders enjoy the shared contempt of the globalists. Putin’s favorability among Americans has been engineered down to 16%, 9% among collusion-besotted Democrats. Thus, while Russia is not a front-burner issue in US households, the Mackinder-MIC catastrophe of a US-Russia rapprochement is rendered all but verboten by these figures as detente would confirm extortioned compromise. 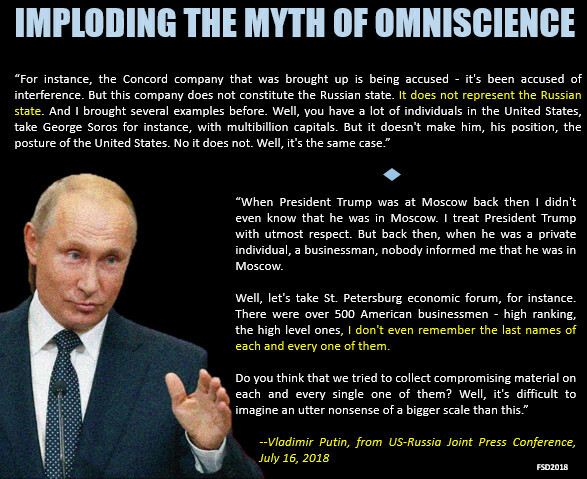 Viewed in this perma-war context, the establishment palpitations caused by Trump ‘being left alone’ with fellow loose cannon Putin make perfect, twisted sense. Suppose a powerful personal chemistry had erupted into a sudden outbreak of peaceful intentions between the two unchaperoned leaders? The prospects for WW3 might have lain in shards. Summit? What Summit? It’s practically been erased from the annals of geopolitics as was the proposed follow-on Summit in Washington. All that can be hoped for are dashed-off corridor meetings at future co-attended events. Alas, this shell-game is breaking down in the Trump Era. Fake News is a more tactile, street-level term for false consciousness propagation. There’s little doubt Trump has a gift for branding. The President is routinely accused of thinking in 220-character Twitter bytes, giving way to charges of truncated intelligence. There may be other reasons to doubt his intelligence. With Twitter, he is fulfilling the greater need of bypassing the Media filter for a communication path more consistent with the needs of direct democracy. The truncation is a non-rescindable feature of the Twitter platform itself. 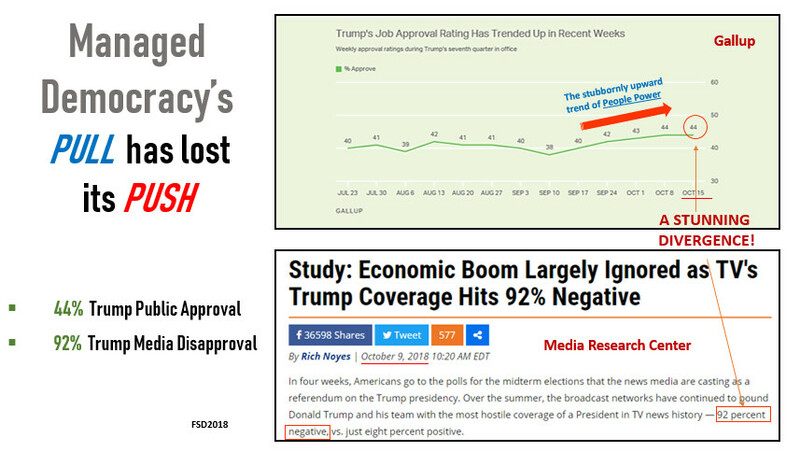 The current Push-Pull narrative divergence –which has the opinion-shapers in conniptions– is on stark display in the recent Gallup vs. Media Research Center numbers (graphic at the bottom of this post). Surely 92% negative coverage evidences Bernay’s “pitiless publicity”. Even after the desperate steps taken to shut down alt-media (and yes, desperate is the term), the divergence grows. The Media responds with ever more dislocating and lurid material. 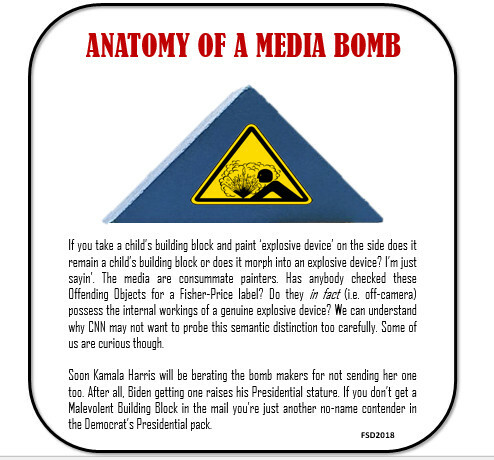 Bombs –or at least clocks resembling bombs– appear on Democrats’ doorsteps with eerie synchronicity. 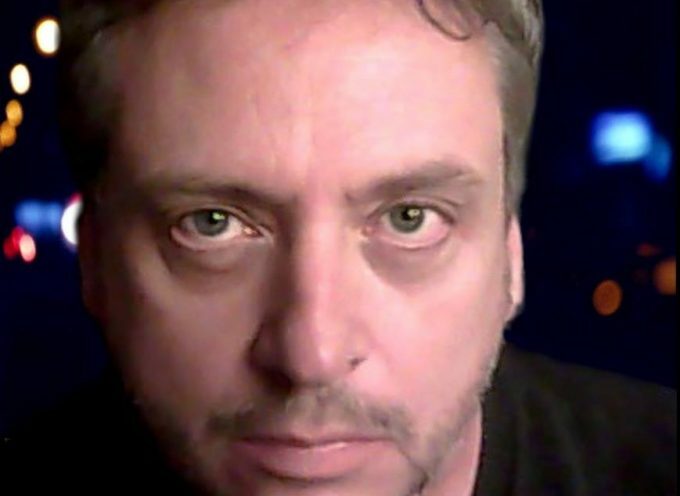 A recursive self-consciousness has now infiltrated the system contributing further noise, not unlike how the pings of a too-high-octane fuel destroy the kayfabe experience (instilled by the car salesman) of a frictionless magic carpet-ride. The clunky mechanics of the process overwhelm the message itself. The collective wisdom of the People has fully determined their passenger status in a vehicle driven by a malevolent chauffeur. Managed Democracy will be hard-pressed to recover their prior innocence. The divergence also implodes the notion that the media is in any way reflective of the population it claims to derive its news from. Clearly the reportage has become prescriptive which is to say, not reportage at all. We’re not happy with the facts where we find them. Thus we will be moving them over here instead, beneath the canopy of our desired narrative. The breakdown of the Pull hasn’t stopped the usual talking heads from pushing endlessly on strings deemed mission-critical by their managers. Like deer trapped in the klieg lights of an indiscernible new reality, they fumble along, in thrall to a dark comedy that takes its cues from absurd representations of untenable narratives. Though opinions on Trump differ sharply, few can dispute his disruptive role in fomenting managed democracy’s narrative crisis, and for putting back onto its heels a myth-making prowess whose influence up until now had been considered unassailable. Why might Trump be an authentic change agent, albeit one with a high probability of derailment or self-betrayal? Because the bifurcating narratives cannot be denied. If the divergence is real, the systemic stress must be equally real. Why, one has to ask, does the corporate press protesteth so much? Therein lies a telling litmus. There’s a tendency to forget Trump’s formal political career is less than two years old and that he contends against a hostile, entrenched security-media complex seventy years in the making. Whether he is already capitulating to insuperable neoconservative power centers or is engaging in tactical ducks-and-feints cannot be confirmed either way. His post-midterm demeanor, and inevitable staffing changes, will reveal much. A verdict today is premature. A breakaway bloc now exists in America along the lines of the red pill, blue pill demarcation. Many have been ‘dispelled’. Let us hope more can Push away from the master’s table forever.